Even if you had known the Nebraska baseball team would trail Omaha 8-2 after five-and-a-half innings, you would’ve figured the Cornhuskers would find a way, right? Omaha came to Hawks Field on Wednesday night with a 12-19 record, after all. No way would the Mavericks come to town and beat Nebraska, even though the Cornhuskers are reeling, you might say. So when they scored a combined five runs in the sixth, seventh and eighth innings, you figured they had positioned themselves for a walk-off victory in the ninth. They couldn’t come up a run short for a second consecutive night. Sure enough, Luke Roskam, who hit a home run and drove in three runs; Angelo Altavilla, whose two-run single cut the deficit to 8-6; and Jaxon Hallmark went one-two-three. And so it ended, 8-7 Omaha, dropping the Cornhuskers to 16-19 as they travel to Rutgers for a three-game, Big Ten series beginning on Friday – with a 1 p.m. (CT) first pitch. In case you wondered, Rutgers, like Michigan State, does not have a ballpark with lights. A power outage and no lights were about the only way Wednesday night could’ve been salvaged. Nebraska seemed lethargic much of the game. And a pitching staff beset by injuries continued to scuffle. 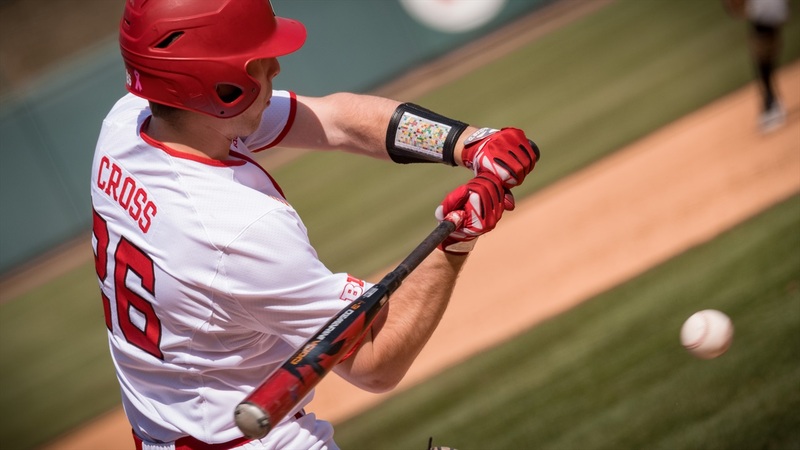 The Cornhuskers used seven pitchers, the last closer Jake Hohensee, who got the final three outs in the ninth – the first on a pickoff at first base – to set the stage for the walk-off that never happened. In addition to giving up seven hits, his predecessors on the mound walked nine, hit five and threw a wild pitch. Nolan Hakel, from Lincoln by way of Hutchinson (Kan.) Community College, pitched for the first time this season. He had played in only four games in the outfield. The game could’ve really gotten out-of-hand; Omaha left runners on base in all but the ninth inning, 13 in all. The Mavericks got the lead-off runner on in each of the first four innings. Erstad said on the Husker radio network beforehand that Nebraska couldn’t let Omaha get off to a fast start and allow the Mavericks to hang around. That advice went unheeded. Omaha scored two in the first and third and four in the sixth then held on for the win. As with Tuesday night’s 4-3 loss to a Kansas State team that had lost nine in a row, the Cornhuskers were in position to win in dramatic fashion. You probably would’ve anticipated such a finish. But you would’ve been wrong again.